Claire has never been very close to her mother. Marie's busy work schedule that requires her to travel has always kept her away, leaving Claire with an au pair, Lisbeth. But now that she's sixteen, Claire thinks she's old enough to be left alone a bit more, and is hoping to find freedom in a car of her own and perhaps a date with cute Matthew Engle. Instead, her party is cut short by a spotting of a malicious werewolf, and Marie divulges a shocking secret: she and Claire are a part of an ancient line of werewolves themselves. Now besides worrying about friends and her new relationship with Matthew, Claire must deal with becoming something that everyone in her community misunderstands and hates, help her pack find the rogue werewolf who is hunting humans, and stay away from the man who is leading the hunt against the werewolves, Dr. Engle--who just happens to be Matthew's dad. Claire de Lune is an interesting werewolf tale, with strong themes of loyalty and acceptance and a dash of romance to liven things up. Though there isn't always a lot of action, which made the book rather slow at times, Claire's struggles with learning to accept who she is and keeping her identity from Matthew, Lisbeth, and her friends provides plenty of drama and angst. Claire's relationship with her mother was well composed, as both mother and daughter struggle with communicating and trusting each other, and Claire attempts to find answers and guidance with another member of the pack, which frustrates Marie. The novel is punctuated with a few short chapters from the point of view of the rogue werewolf as she stalks her prey, which creates enough suspense to keep the book from dragging too much. Though some may finds the climax predictable, the ending has some nice action and twists, and Johnson concludes the book nicely. 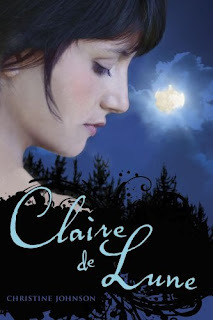 For the YA supernatural enthusiast, Claire de Lune is a great summer read with a sweet romance and just enough thrills. Cover Comments: I like this cover, the title font is delicate and feminine, and I like the model used. The way the moon is obscured by the clouds is really neat as well--very pretty! Sounds great. I'm adding it to my list. Glad to hear you enjoyed it! Wanting to read this one. Just started this one. Finding it a bit slow and almost middle grade instead of young adult. But I will continue on in hopes of it getting better.